Mr. & Mrs. Forever! What a great title for any couple! 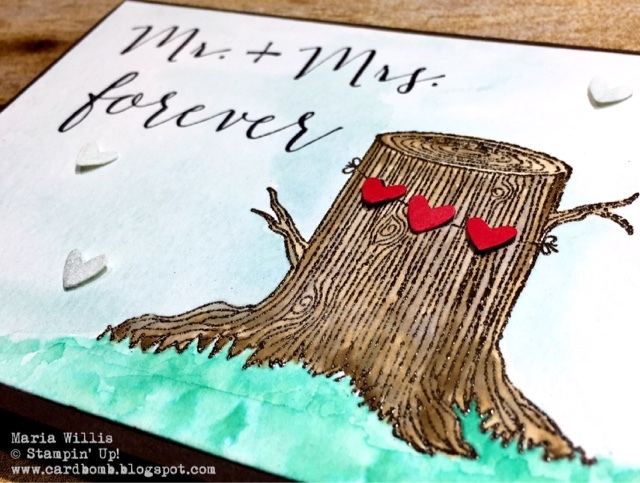 I have really been loving this Always & Forever set for making some fun wedding and anniversary cards. This one is an anniversary card and is already winging its' way to a special couple in another country! This tree is so fun and someone mentioned to me yesterday that it reminds them of the Giving Tree.. Ya know what?! It reminds me of the Giving Tree too! On this card I heat embossed the tree in Early Espresso (stamp in versa mark first, then in Early Espresso, then heat emboss with clear Embossing Powder) and then watercolored it with Early Espresso as well. The grass was done with Emerald Envy and there is a light wash of Soft Sky over the whole background. I got a scrap of shimmery white paper and washed some Soft Sky over that too. Then I used the retired Owl Punch to punch out some shimmery hearts and some Real Red hearts to add to the tree. I know the punch is retired but I also know that so many of you have it! My opinion on retired items is that if you love them, you should use them. 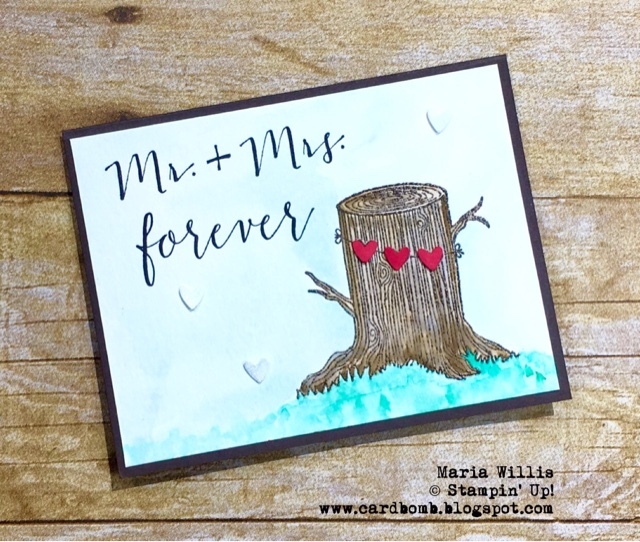 Very often retired items combine perfectly with Stampin' Ups! amazing new product lines. I love the owl punch and most often use it for these adorable little hearts which just happen to work perfectly with this new stamp set. That's all for today folks! As always, if you have any questions at all please leave me a comment or shoot me an email at: mariawillis@hotmail.com If you're interested in making this card yourself and need to purchase some product please check out the product list below. You can click on any item that you're interested in and it'll take you right to the product info in my store. Have a great day today. I hope it's the start to a truly wonderful week!